The HRCA was established in 2006 by the Hungarian Reformed Church Synod. Since 2008, the organization has responded to medical emergencies worldwide. 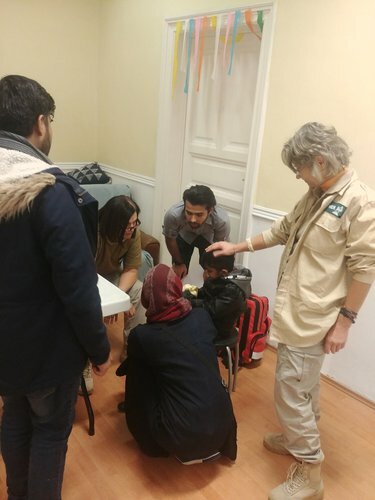 Their most recent mission was in Bangladesh, where they provided medical aid to the Rohingya refugees who had to flee their homes due to the fear of persecution. Once a year, HRCA coordinates a training for its doctors, and this year Kalunba was able to provide a location for their training whilst also being able to use their services for Kalunba beneficiaries. Kalunba hosted nine medical professionals, including a dentist, a gynaecologist, a plastic surgeon, a general practitioner and many more. This visit was crucial for the beneficiaries of Kalunba. Many do not have active health insurance, and others have health problems but do not understand why they are suffering from certain symptoms and, unfortunately, there are also those who have not had a chance to consult medical professionals due to a plethora of reasons. Therefore, this visit not only allowed them to seek out a professional opinion, but also allowed them to skip over the long lines, fees and since Kalunba was the location for the visit, there was a sense a familiarity. Additionally, further referrals were also made in cases that required more medical attention. A total of 45 beneficiaries from Iran, Pakistan, Ethiopia, Iraq and Afghanistan, from all different ages, were able to participate. Doctors were not only able to treat the patients, but also able to explain how day to day activities may be dangerous, such as consuming too much energy drinks and keeping our mobile phones too close. Thanks to the service of the doctors of the Hungarian Reformed Church Aid, many of the beneficiaries of Kalunba Social Services Ltd. were able to get professional medical attention.